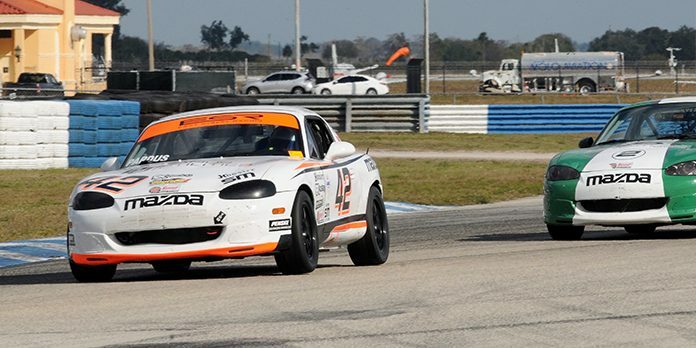 SEBRING, Fla. – The SCCA Hoosier Super Tour season got underway with spirited driving on Saturday at Sebring Int’l Raceway, where seven race groups ran 29 races around the famed 17-turn, 3.74-mile race track hosted by Central Florida Region. Though Goulart tried to work with Drago to challenge Pardus, it was clear with a lap to go that they had nothing for the hot shoe. Instead, Goulart peeled off going into Sebring’s tight final corner and drove to the inside. That proved the right move, as Goulart was able to sneak into second place at the stripe by just .153-second.